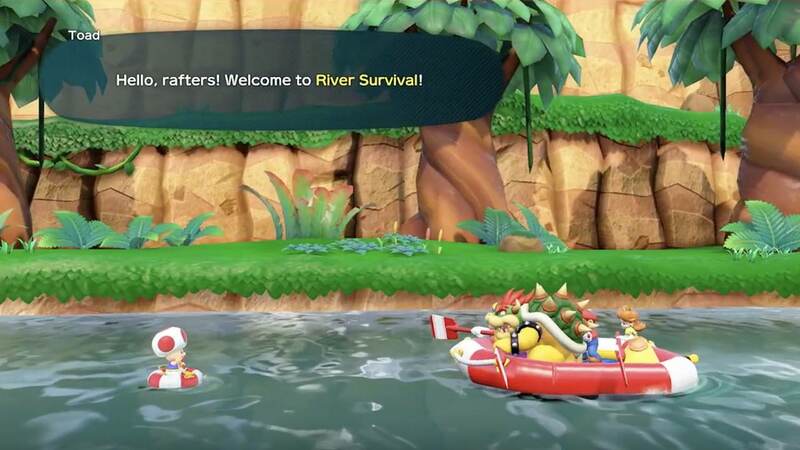 Nintendo has revealed River Survival mode in Super Mario Party, shown in brand new gameplay that was filmed at their RedCube studio at Gamescom 2018. Before that, a new tropical-themed board was shown. Every board in the game can be played in free-for-all or two-versus-two, and, on this one, you must move between four small islands in your quest to secure more Stars than your competition. Toadette is the one that will hand out the Stars, and, as one player reaches her, she will use balloons to float to another island. To reach her, you will need to use Warp Pipes and bridges to travel between the islands, but beware as, for example, the sand bridge will collapse in time. The River Survival mode is a co-operative experience, where, in this demonstration, we see four players using the Joy-Con to paddle their way down a river in a raft. You’re up against a time limit, and, with a branching minimap in the top-right, are free to choose which end goal you want to reach. There are hazards that will slow you down, such as Cheep Cheep schools, and the minigames that you participate in will reward you with bonus time based on how well you do.